Hello summer! 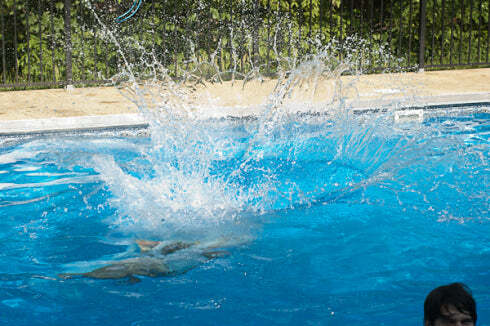 To me, summer has always meant lots of time spent laying around a pool or lake, and cookouts. And cookouts usually mean boring store-bought buns. Not anymore. Not for me. Over Memorial Day weekend, my family had the chance to hang out around our cousin’s pool, swim, and have fun together. Perfect start to the summer, I think. I got ambitious in the early-summer heat wave and made these lightly crusty, half-whole-wheat buns studded with chunks of dill pickle and onion, and covered with sesame seeds. 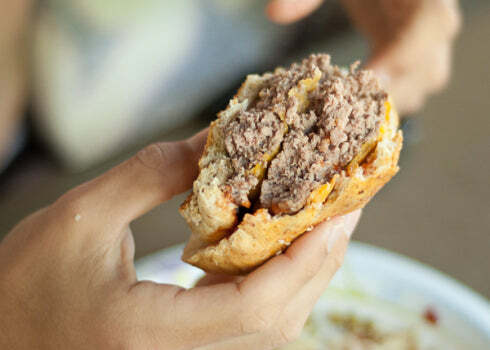 I think you’ll find they have a knack for enveloping a burger (and all its trimmings) with tender loving care, and they’ll make you want to eat every last bite—even if there’s more bun than burger. Now THAT’S saying something. These are the buns of the hamburgers of your dreams. I really don’t believe I’m overselling them here. You’ve probably forgotten how fantastic a burger can be– I know I had. 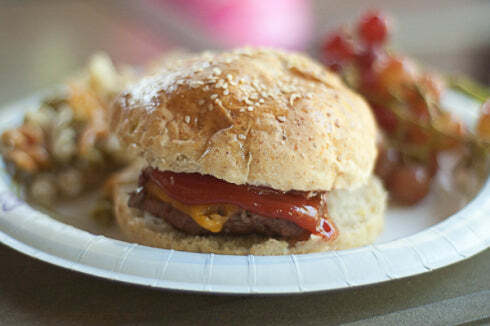 The flax seed, milk, egg, and butter make them just soft and rich enough to cradle the burger and toppings, and the pickle juice, chunks of onion and dill pickle add tangy, interesting texture to every bite. 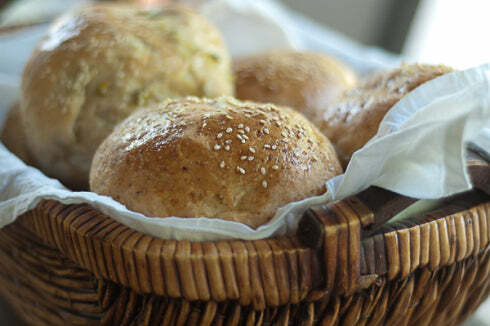 I sometimes think of homemade bread as a fall and wintertime treat, when it’s chilly outside and cozy in the kitchen. But I’ve found that summer is actually rather perfectly suited for baking bread. Case in point: I found that a car parked in the shade with the windows cracked makes a fantastic place for dough to rise. I was able to shorten the process just a bit because everything rose so quickly – one hour on the first rise, and 30 minutes on the second. And since these bake in less than 20 minutes, you don’t have to heat up your kitchen for too long, either. Tell us in the comments if you have similar results where you are. 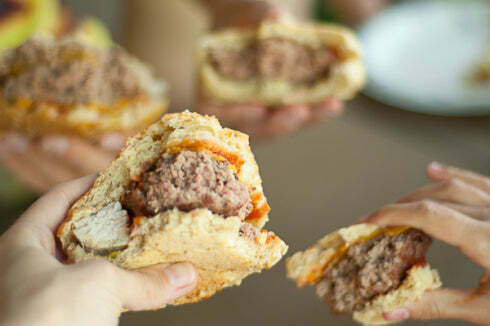 A (burger) toast to summer! By the way, these also make a great stage for BBQ sandwiches, and I’m pretty sure if you have any left over, they would fancy up a simple cold-cut picnic sandwich, too. Buon appetito, and Happy Father’s Day to all the dads out there! Mix warm milk, warm water, sugar, and yeast in a small bowl and let proof for 5 minutes, until it is bubbly and smells sour. Meanwhile, in a large bowl, mix flours and flax seed, and then mix in butter with a fork until the mixture is the size of small crumbs. Add 2 beaten eggs, yeast mixture, and pickle juice, and mix together. When mixture is combined and no more flour is visible, turn onto a lightly floured surface, and knead for 8-10 minutes, until dough is silky and springy. Try not to use too much flour, even though the dough is a little sticky, as adding more flour will make it tougher. Roll dough into a ball, (you may wish to coat with oil at this point to prevent sticking as it rises) return to bowl, and cover with plastic wrap. Let rise in a warm place about 1 hour, until doubled. Prep chopped pickles and onions. Cover cookie sheets with parchment paper, or spray with nonstick spray. Pat down the risen dough, and divide it into 16 equal-sized pieces. Stretch each piece into a long, flat, rectangle, and sprinkle about 1 Tablespoon chopped pickle and 1 Tablespoon chopped onion down the length of it, and then roll it up. Form the rolled piece into a round, smooth bun shape, and set on cookie sheet. Repeat for all pieces of dough. It’s all right for them to touch on the cookie sheet, but they will cook together if they are too close. (They come apart easily.) Cover with plastic wrap coated lightly with nonstick spray, and let rise for 30-60 minutes, until puffed and springy to the touch. Preheat oven to 400°. Beat remaining egg with 1 Tablespoon of water, and brush mixture over finished buns. Sprinkle with sesame seeds, and any remaining pickle and onion. Bake for 15-18 minutes, until golden brown on top. Let cool, then slice in half and enjoy. Notes: Makes 16 4-inch diameter buns. Keeps up to 2-3 days in sealed container in cool place, and even longer in fridge. Tastes TERRIFIC toasted. Recipe can be halved if desired.